Acronym AMR stands for additions, modifications and replacements. In a steel plant which is operating for a number of years, implementation of AMR schemes is a necessity if the efficiency and productivity of the plant is to be maintained over a large numbers of years. Expenditures on AMR schemes are capital in nature and usually these expenditures are not very large and they are small in nature. However these expenditures change the capital structure of the organization. This is in contrast to the maintenance activity in the steel plant where equipment parts or equipments are replaced and the expenditures incurred during maintenance are part of the operating expenses of the plant. Necessity of AMR schemes in an operating steel plant occurs due to the following reasons. The design deficiencies become visible once the steel plant has been operated for a number of years. These deficiencies come in the way of plant being operated at the desired efficiency and productivity levels. For removal of these design deficiencies, some additional equipment may be needed or some modifications in the process may be necessary. May be some equipment need replacement with different but similar equipment. AMR schemes help management in removing design deficiencies and bring back the steel plant to the designed efficiency and productivity levels. All the steel plant equipments donot have the same expected life. Some equipment has a long life while life of some other equipment can be enhanced by replacing some worn out components during maintenance. But in some the life is not long, nor can it be increased by maintenance. Such equipment become a weak link in obtaining the desired efficiency levels and the productivity levels of the process since the break downs in these equipment increase drastically once their life is over. AMR schemes help management in replacing such equipment and bring back the steel plant to the designed efficiency and productivity levels. During the operation of steel plant over some years, it is sometimes noticed that some process has capability of achieving a higher level of efficiency and productivity but some factors are restricting it and coming in the way of the process achieving the higher level of efficiency and productivity. Removal of these factors by way of additions and modifications through AMR schemes helps the management to achieve the higher output from the process. Sometimes during the plant operation, it is noticed that the safety aspects of the process have been compromised during design stage of the process. AMR schemes help the management to carry out the necessary modifications to enhance the safety level of the process. The three components of AMR schemes are described below. Additions are those schemes that introduce one or two small equipment in the process flow in order to enhance its productivity, efficiency, safety, and/or reliability. The type of the equipment to be added and its specification is determined by analyzing the operating data of the process for a period of time as well as applying the theoretical aspects of the process. Once the sizing of the equipment is over and its location in the process has been determined then its incorporation in the process layout is carried out through engineering. After this total cost of the AMR scheme is determined and the cost benefit analysis is carried out. Then the complete proposal is put up to management for approval before implementation. Equipment is to be added can consist of metallurgical, mechanical, utility, instrumentation, electrical or control equipment. Additions can also be in the form of off line measuring and testing equipment. Additions can also be part of the previous process to enhance the quality of input material for the process. Additions can also be incorporation of some equipment which enhances the product quality or/and product packing and hence increases the customer satisfaction level. Modifications are those schemes which consist of incorporating some changes in the process flow in order to enhance its productivity, efficiency, safety, and/or reliability. Modification can also be sometime carried out in the control scheme. Sometimes modification becomes necessary to incorporate changes in some of the equipment design for enhancing the availability of the equipment. Modification also helps in making it possible the monitoring of some additional parameter of the process. Modification schemes also sometimes consist of making changes in the process parameters so that the process output is more consistent and reliable. Modification schemes may also consist of systematizing of the process flow so that the time of processing gets reduced. Modification schemes can also involve incorporation of changes in the actual process which helps in improving the acceptability level of the product. 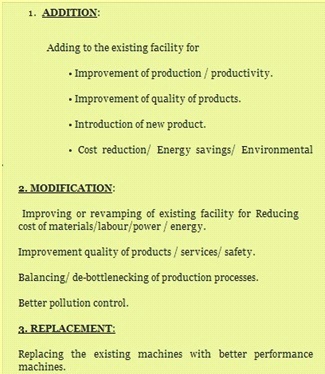 In short modification schemes are those schemes which improve the process as well as the product of the process. Modifications are also needed if the focus of the management changes due to change in the operating environment. For example, if the new focus is for energy conservation then energy inefficient processes are to be modified to make them more energy efficient. AMR schemes under replacement head are sometimes confused with the replacement of equipment taking place during maintenance. But two are completely different from each other. In case of maintenance one replaces equipment which is under breakdown or which need a change during preventive maintenance by an identical equipment so as to not affect the working of total process. This is not the case with the replacement under AMR schemes. Replacement under AMR scheme takes place due to the following reasons. Replacement under AMR scheme takes place if the installed equipment has become outdated and original equipment manufacturer (OEM) is no more providing the support of the spare parts for maintenance of the equipment. Technology used in the installed equipment has become outdated and it makes the process non competitive when compared with the process having equipment with the latest technology. Regulatory laws have undergone changes and the installed equipment is not able to meet the new regulatory requirement. Replacement of some equipment may be needed if the process automation is being upgraded since the installed equipment may not be compatible with the new automation system. Sometimes due to change in the marketing scenario, customer changes his requirements with respect to the product quality and product requirements. To meet these new requirements certain equipment will need replacement. Each AMR scheme is considered as an internal project. It is necessary that an internal techno economic feasibility report justifying the project is made for each AMR project and submitted to the management for acceptance. The implementation of the project starts only after management accepts the project for implementation and allocate budget for its implementation. The procedures for implementation of an AMR project are similar to the procedures for any other projects.